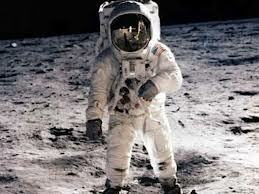 In July 1969, mankind started their trek to the moon and I was with them. I watched them blast off and then as they traveled to the moon, I was with them. When I went to bed at night, I pretended I was there, riding in that small little capsule to the moon. My mom bought me a small plastic box about the size of a lunch-box. When it unfolded, it was the inside of the lunar lander and command module. On July 20th, 1969 my imagination was running at full tilt. I sat next to my mom and dad in front of the TV and was totally and completely immersed in what it must be like. I lived through each second of descent and landing with the crew. I was there, my imagination that is. The moment of touchdown and the elation of the world, I was there. After the landing on the moon came the wait. I remember it taking forever but listening to the journalists on TV (I can still hear Walter Cronkite in my head), I continued to watch until the shadow of Armstrong became visible in the dodgy B&W transmission. After the first step on the moon, I took a breath. I’ve always thought the words that he spoke, “One small step for man, one giant leap for mankind.” were as perfect as they come. But more than this, I felt proud to be an American because we weren’t saying this was an American step, this was a step made for all people of the earth. I remember reading an interview by one of the astronauts while on tour around the world and he said that people were chanting “we did it” or some incantation thereof. Neil Armstrong died yesterday but my recollection of the events that unfolded on July 20th haven’t dimmed. These events added to our confidence as a people. Statements like “If we can put a man on the moon, we can <fill in the blank>”. It certainly expanded the envelope of what I thought possible.